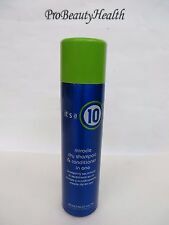 it's a 10 Silk Express Miracle Silk Conditioner, 5 oz. Condition is New. Shipped with USPS First Class Package. This product has transformed my hair from dry and lack luster to fabulous. It smells so good last for days. High recommend this the conditioner and a must have the leave in conditioner. This is a good quality product that has been used in my home for years. Quick shipping and an easy transaction. It's expensive stuff but it makes your hair look great. Plus it makes your hair smell fantastic for days.